Earlier in March, Microsoft launched its Xbox Live gaming service on Android and iOS. With this move, developers can now incorporate various elements of the Xbox Live ecosystem into their mobile games, such as Gamertags, friends lists, achievements and more. At a recent panel at the Game Developers Conference (GDC) in San Francisco, Microsoft provided more details on how this entire process will work, as well as all of the benefits it affords to developers. Microsoft wants to make Xbox Live mobile implementation easy, according to Schiefelbein, so the company is offering the service to developers for free through a mobile version of its ID@Xbox independent games publishing label. Once registered, developers will be given a software development kit (SDK) that lets them fine-tune Xbox Live settings for their games. To that end, developers can use Xbox Live features in their games across platforms a-la-carte, minimal data and online safety requirements and no pre-certification required. There is also no cost for developers or players to use Xbox Live on mobile. Further, the platform will offer Xbox Live’s signature “trusted gaming identity” that provides more than 99.9 percent service availability every month on top of privacy, online safety and parental controls. At the same time, developers can leverage community tools and analytics to better manage their game’s player bases. Finally, Microsoft says Xbox Live offers “comprehensive consumer experiences” by bridging the gap between PC, mobile, web and console to engage larger player bases at once. As it stands, the company says over 4.28 billion game hours are played on Xbox Live every month across over 64 million monthly active users. 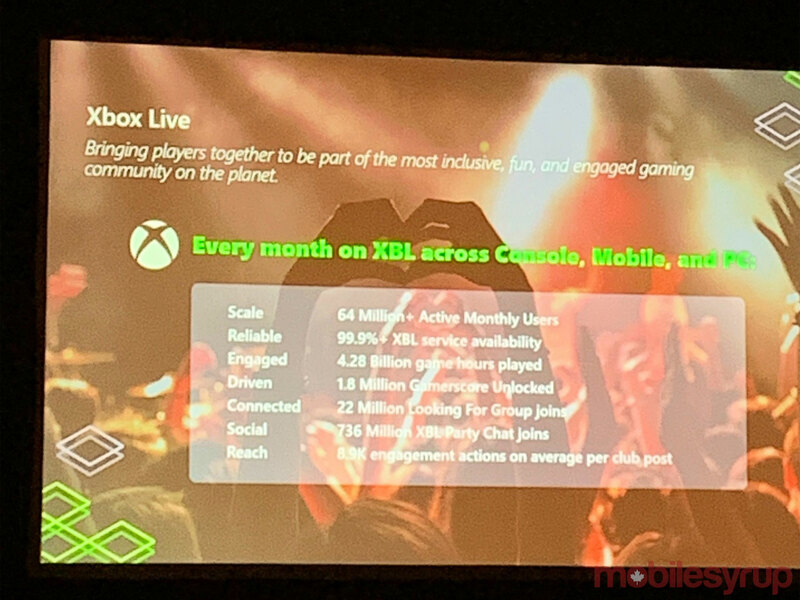 One unified cross-platform profile through Xbox Live also makes it easier for all these users to sign in and manage their accounts, said Schiefelbein. 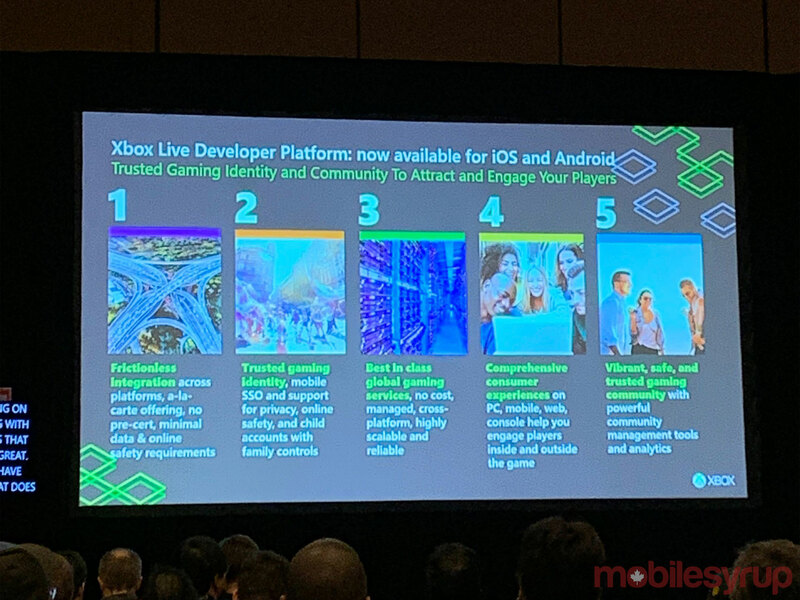 Xbox Live mobile integration is just part of Microsoft’s recently revealed Game Stack platform, which brings together all of Microsoft’s developer services into one central hub. The general design philosophy behind this is to let developers leverage as much or as little as of Microsoft’s services as they wish. To demonstrate this, Team Xbox software engineer Ramsey Khadder ran a demo of a unicorn slingshotting game where players have to see how far they can launch the mythical creature. While using the SDK, developers can go through a “sandbox” made up of various tools to bring various elements of the Xbox Live experience to mobile games. “This is a way to make changes to your Xbox Live configuration in an isolated environment,” said Khadder. He noted that developers are only required to implement Xbox Live Gamertags and terms of service into their games. Otherwise, they’re free to pick and choose which features of Live that they want to include in their games. For example, developers can choose to incorporate Friends Lists for players for online community functionality. Developers can take this one step further by tweaking the notifications that friends get from one another. Ramsay used the example of Minecraft telling a player that their friend has just entered a certain area, rather than the more broad notification that they’ve come online. Similar flexibility is offered in achievements. Developers can choose to enable a tracker that shows players how much percent of the way they are towards unlocking an achievement. For the purposes of the demoed game, this could be an achievement like “fling the unicorn 400ft 10 times,” and players who have done this five times will see a bar filled 50 percent of the way. While the unicorn game doesn’t feature a story, Khadder also showed off a feature that would be useful to developers of narrative-driven mobile games. In the SDK, developers can choose to hide achievement lists so players will only see scenario-specific achievements after unlocking them, meaning no descriptions will spoil any story moments for anyone. That said, Microsoft reiterated previous comments that there are no plans to bring this SDK to the Nintendo Switch.